Some people call Denver the “Napa of beer,” and some people aren't wrong. 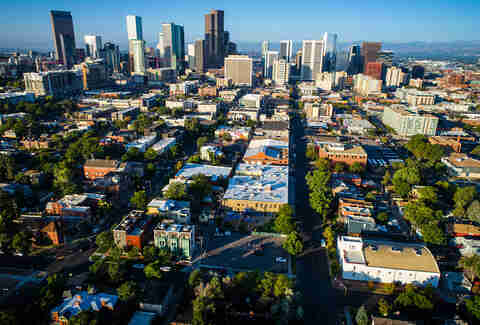 With more than 70 breweries operating in the state’s capital, the Mile High City is a major hub for craft beer stans. From clean and crisp lagers to complex sours, Denver brewers are making it all, and just about every dining and boozy establishment in town is serving up expansive selections to thirsty patrons. While it’d take days, or even weeks, to fully dig into every single brewery and beer bar in town, we put together a list of some of the spots locals can’t get enough of. I hope your liver is ready for the ride. Just landed in Denver and itching to start your beer journey? Head to the River North Art District and grab a seat on the 4,000-square-foot outdoor patio at RiNo Beer Garden. 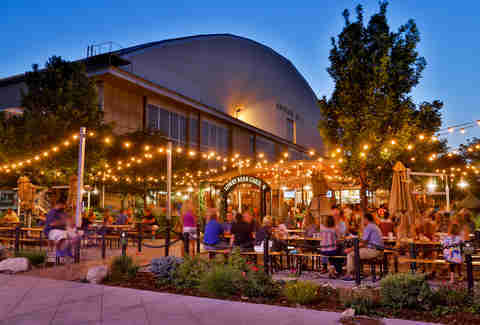 This artsy neighborhood is loaded with breweries, and the RiNo Beer Garden serves a huge selection of their offerings (and German imports) from more than 60 taps. Enjoy some German-inspired pub grub here, and take advantage of a generous happy hour menu Monday through Friday. You’ll have to venture east of downtown to find the Lowry Beer Garden, but its communal seating, extensive Colorado-repped beer list, and German fare make it worth the trip. Order up a beer brat and taste your way through the beer list, but be sure to save time to check out the neighboring Wings Over the Rockies Air and Space museum -- a former air force base-turned-museum where you can check out a huge collection of iconic aircrafts. Denverites love a good rooftop bar where they can sip a cold one and watch the sun disappear behind the Rocky Mountains. Tap Fourteen, in the lively Lower Downtown (LoDo) neighborhood, is such a bar. 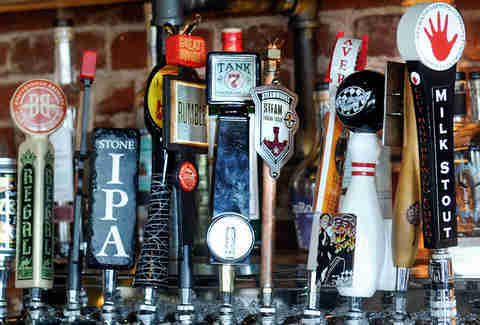 This beer garden highlights Colorado breweries via its 70 taps, plus its close proximity to Coors Field makes it a great place to swing through for a burger and beer before catching a Rockies game. 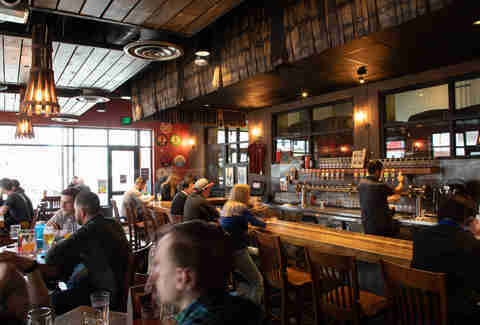 Falling Rock Tap House is a beautifully boozy establishment, a must-visit for anyone looking to nerd out on craft beer. The roomy bar boasts a super casual vibe, with more than 75 beers on tap and another 130-plus options in cans and bottles. If you can’t find a beer you like here, there’s something wrong with you. The Falling Rock keeps a running countdown to the Great American Beer Festival year-round, and its exceptional selection of hard-to-get beers make it a popular haunt for industry folks. Take your night to the next level at Star Bar, a funky little beer joint located downtown. At this charming dive, open since 1959, you’ll find a solid selection of some of the best craft beer available in the state. You’ll probably need a couple if you’re going to get in on the karaoke action that takes place every Tuesday and Thursday. Elevate your craft beer experience at Euclid Hall, an innovative tavern that takes beer very seriously. Not only are all of the waitstaff at Euclid Hall cicerone-certified -- beer’s answer to sommeliers -- they’re friendly and happy to help you find the perfect beer pairing for the menu made of small and shared plates. Think snacks as varied as fried cheddar curds, pad Thai pig ears and duck poutine. The easy-to-navigate beer menu is diverse, organizing beers under headings like “algebra,” “geometry,” “trigonometry,” and “quantum mechanics,” each section progressively more complex than the one before. If you want to know where the cool kids are hanging out, it’s most likely at the bustling taproom and outdoor patio at the Denver Beer Co. Here, young professionals drink beers with names like Unicorn Sparkles (a brut IPA), Pretzel Assassin (an easy-drinking amber lager) and Princess Yum Yum (a flavorful raspberry kolsch). 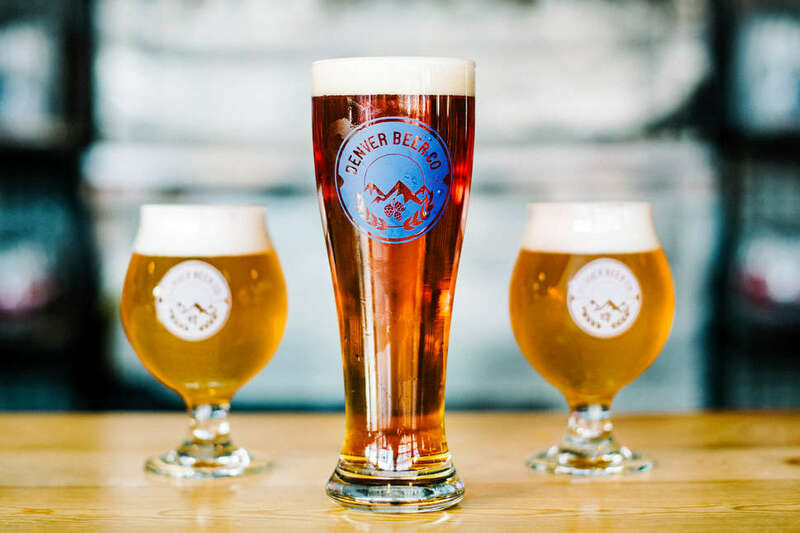 Denver Beer Co. also launched a sister brewery right next door called Cerveceria Colorado, focused on creating a welcoming and inclusive place for all beer drinkers. And the Horchata Blonde on tap? Get it while the getting is good. A new kid on the block, Woods Boss has fast become a favorite in Denver’s beer scene. This brewery has a little something for everyone, with 20 rotating taps serving up playful brews like Scottish ale and chardonnay barrel-aged saison. The bright and open taproom is accentuated with rustic, woodsy touches like a sprawling handcrafted wooden bar and even a tree stump doubling as a table. Be sure to try The Oswald, a hopped-up hazy IPA, and schedule your visit around the busy calendar of live music. Small but mighty, TRVE is a haven for beer-loving metalheads and is as niche as you can get. The taproom speakers are always playing a steady stream of metal, but the draft list is a lovely blend of mixed culture varieties and delightful farmhouse ales. Plus, a visit to TRVE means you’re only a short walk from a handful of other celebrated breweries in Denver, like Baere Brewing Co. and Banded Oak Brewing Co.
Great Divide is a staple in Denver’s craft beer community, churning out crowd-pleasers like Yeti Imperial Stout, Denver Pale Ale and Colette Farmhouse Ale since 1994. While Great Divide has a busy taproom in the city’s Ballpark Neighborhood, Barrel Bar located in the RiNo district is stirring up a whole lot of excitement for local fans. The beautiful, spacious facility is packed with barrels of aging beers, available on tap when they’ve reached their peak. Seasonal and limited offerings are many, and daily tours give you a peek behind the scenes. Traditional, clean German-style lagers attracts beer enthusiasts to the Bierstadt Lagerhaus bar. This lager-only brewery is housed in a massive 21,000-square-foot production facility called The Rackhouse, also home to a cidery and a kitchen serving a menu of beer-inspired dishes. 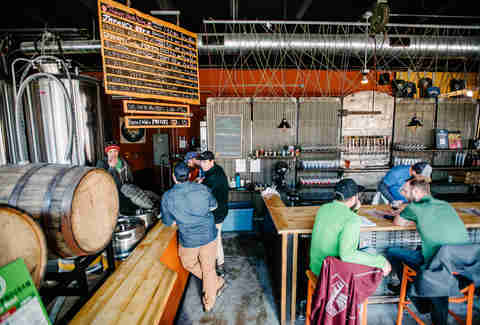 Bierstadt’s location in the RiNo neighborhood is also within walking distance to several other visit-worthy breweries like Epic Brewing Co., Ratio Beerworks and Our Mutual Friend. Prepare to get nerdy. Started by three avid homebrewers, Cerebral Brewing perfects the traditional and pushes boundaries in equal measure. The taproom is a much cooler version of a high school chemistry classroom, with even cooler homework. If you’re a fan of IPAs, Cerebral won’t disappoint, but experimental brews take advantage of barrel-aging, interesting ingredients and mixed fermentation, drawing a lot of attention from beer buffs. Argonaut Wine and Liquor is a 40,000-square-foot playground for aficionados. The longtime retailer is one of the largest liquor stores in the city, with a big emphasis on showcasing Colorado’s breweries. If you’re looking for a quick and easy way to learn more about the city’s colorful brewing scene, a trip to Argonaut is a good place to start. No time like the present to stock up on “souvenirs” to remember your trip by. Tucked in an unassuming house in Denver’s quaint Platt Park neighborhood, Craft Alley is a unique take on traditional bottle shops. Instead of focusing on bottles, this retailer serves up 32-ounce crowlers, the canned version of a growler from the masterminds of Oskar Blues, one of the states most innovative breweries. Pre-packaged crowlers from local breweries like Mockery, Fiction and Launch Pad fill the coolers at this quirky shop, which also offers a subscription program for trying new brews. 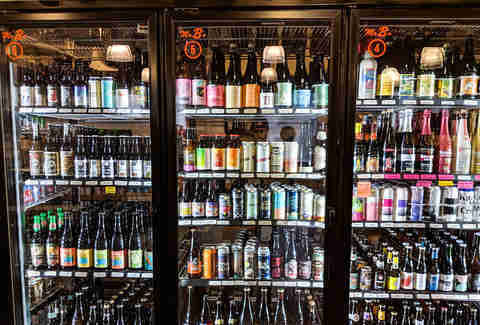 You’ll find a super local list of beers on the cooler shelves at Mr. B’s Wine & Spirits in downtown Denver. The small bottle shop proudly serves 500 beers and even has dry shelf space dedicated to beers intended to be cellared. If you’re looking to get the scoop on the best local breweries, the craft beer-loving folks at this shop can certainly guide you. The mac daddy of all beer festivals draws thousands of people to Denver each fall for a three-day celebration of craft beer. To say it’s massive is an understatement: Imagine more than 800 breweries pouring 4,000 beers to over 60,000 attendees. The most sought after breweries in the country converge onto Denver to pour their newest wares and compete in 100 categories of beer. If you’re lucky, you’ll be served by some of the coolest celebrity brewers in the industry. Tickets are $85 for nearly five hours of unlimited one ounce pours. But be aware, tickets for this festival sell out, so be on the lookout for ticket sales to open to the public in late July/early August for a chance to witness this boozy madness for yourself. Collaborations are one of the major cornerstones of the brewing industry, and that kind of camaraderie is on display every year at Collaboration Fest. At this unique festival, now in its fifth year, you’ll only be able to sample beers brewed as part of a collaborative effort. When creative minds get together for something so delicious, magic happens. Taste through 100-plus collaborations from more than 200 collaborators. When is it? Mid-winter. Kidding! It's always at the height of summer. Colorado boasts more than 300 sunny days a year, so outdoor beer festivals are kind of our thing. 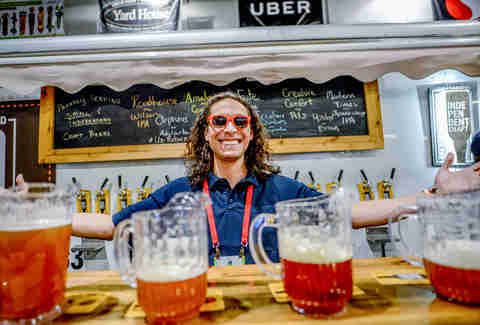 In the summertime, there’s never a shortage of fun, but for beer and music lovers, the Summer Brew Fest on July 27, 2019 should be on your calendar. The festival celebrates the city’s vibrant music scene as well as local craft artisans. Beer? Music? Sunshine? Count us in. Tyra Sutak is a Boulder-based freelance writer and photographer that can usually be found hiking on a trail somewhere, or stuffing her face with nachos, when she’s not tasting her way through all of the IPAs in Colorado.